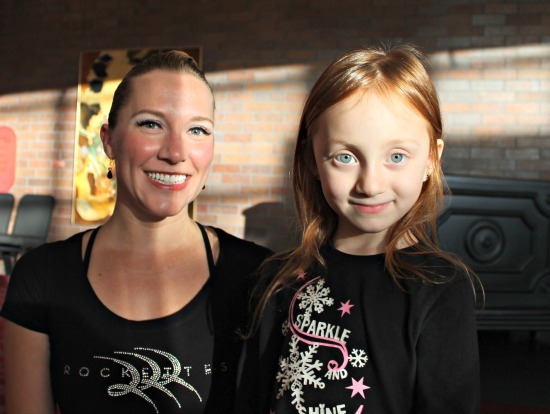 Last week I had a very special mommy/daughter date to see the Rockette’s perform in the Radio City Christmas Spectacular at the Straz Center in Tampa courtesy of GoGo Squeeze. We had a full afternoon and evening filled with fun. Following our kick class we enjoyed the afternoon downtown with friends and had some dinner before the evening show. Our seats were towards the front in the Orchestra level and I don’t think she realized just how big the Straz Center was; I don’t think she ever looked behind us. She hopped up on the booster so she could see above the adults in front of her and was ready for the show to begin. This was the look on her face almost the entire night! 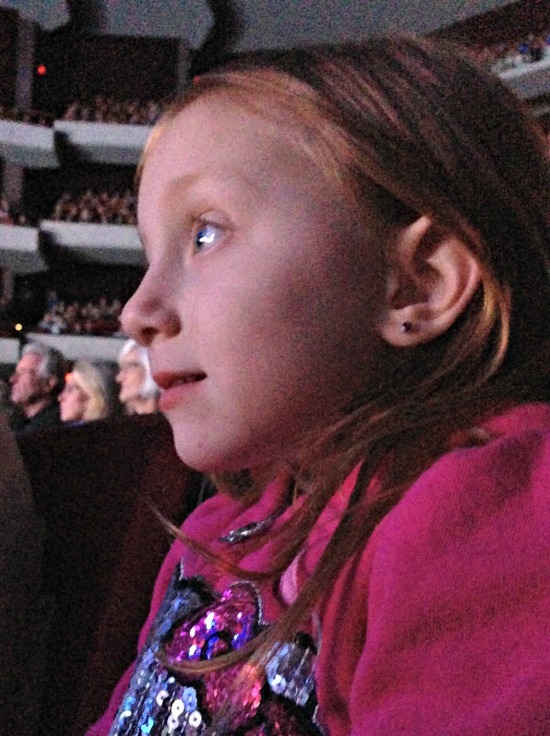 Her eyes were glued to the stage and she was so excited to see….Santa! Yes, he actually has a pretty big role in the production and she was thrilled! There was even a scene where all of the Rockette’s came out dressed and Santa which amazed her even more! She had a friend with her all evening and the two of them were a riot! I’m not sure the patrons in front of us appreciated their excitement as much as we did though. The two of them were standing up for the first part of the show leaning on the back of their seats. I really wish I had a picture to show you how cute it was (but no cameras were allowed during the performance). We did have to teach them a little theater etiquette after the intermission though because those lovely patrons in front of us were a little annoyed by our cuties! I guess they forgot what it was like to be 4 years old. They did much better for the rest of the show and stayed in their seats. They didn’t ever learn about inside voices but I don’t think anyone minded their giggles (too much). There was a part towards the end where the Rockette’s shot ribbon streamers into the crowd and the girls played with the ribbon and laughed for the rest of the show. One of my favorite parts of the show was the Living Nativity. I applaud the Rockette’s and the show for their beautiful performance and for including the story of Christmas in their show. It really was the best part of the show for me. I think we officially wore out both girls because they were practically asleep in our arms on the way to the car. It took me longer to get out of Tampa then it took her to fall asleep. Guess what? It’s not too late to see the Rockette’s in Tampa!! They will be at the Straz Center until December 29th!! Reserve your tickets for the Radio City Christmas Spectacular today! I really wish I had taken my husband and son along with us; I think they would have enjoyed the show as well. Here’s a short glimpse at what you’ll see…. A very special thank you to GoGo Squeeze and the Straz Center for inviting us to the kick class and the Radio City Christmas Spectacular. We truly had an amazing day and can’t wait to do it again next year! !